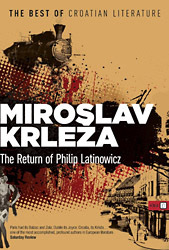 Of Krleža's many writings – poems, plays, short stories and novels – "The Return of Philip Latinowicz" is the most widely acclaimed. Philip, the protagonist, is a successful but disillusioned painter of some international repute who returns to a small cathedral town in Croatia after an absence of twenty-three years. He hopes that revisiting his cultural roots will inspire him to create the perfect work of art and thereby restore his faith in both art and life. Haunted by his troubled childhood, however, he falls in with shady characters and discovers the emotional, intellectual, and imaginative poverty of small-town decadence. In "The Return of Philip Latinowicz" Krleža explores the rottenness at the heart of bourgeois life, its dishonesty and its poverty of spirit. At the same time, he explores the tensions pulling on an artist caught in two worlds and facing existentialist doubts. Miroslav Krleža is the most significant Croatian literary voice of the twentieth century. Miroslav Krleža is a master stylist who is often compared to such Western literary luminaries as James Joyce and Marcel Proust. The Croatian Miroslav Krleža is among the most neglected of the world's great writers.